Plus, with your Würth Baer Supply pricing, you’ll SAVE even more money over the Manufacturer’s Suggested Retail Price (MSRP) purchasing any of these items and the rest of the Rev-A-Shelf product line. $300 order = 3 entries… and so on. EARN EVEN MORE ENTRIES BY PLACING YOUR ORDERS ONLINE! 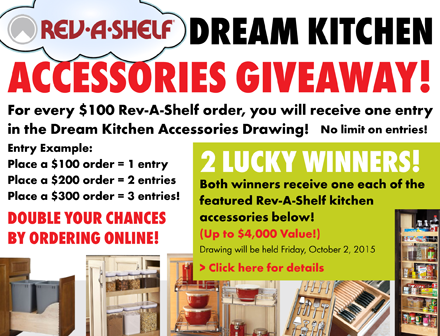 Get DOUBLE entries for placing your Rev-A-Shelf orders through our Website! So, using the example above, place a $300 Rev-A-Shelf order and get 6 entries in the drawing! Drawing will be held on Friday, October 2nd, 2015. This entry was posted in Kitchen, Promotions and Sweepstakes, Rev-A-Shelf and tagged cabinets, contest, drawer, drawing, improvements, kitchen, organizer, pull-out, rev-a-shelf, win. Bookmark the permalink.